The indexes used by local, national, and international governments to monitor progress toward sustainability do not adequately align with their ethical priorities and have a limited ability to monitor and promote sustainability. This book gives a theoretical and practical demonstration of how ethics and technical considerations can aid the development of sustainability indexes to overcome this division in the literature and aid sustainability initiatives. Measuring and Evaluating Sustainability develops and illustrates methods of linking technical and normative concerns during the development of sustainability indexes. Specifically, guidelines for index development are combined with a pragmatic theory of ethics that enables ethical collaboration among people of diverse ethical systems. Using the resulting method of index development, the book takes a unique applied turn as it ethically evaluates multiple sustainability indexes developed and used by the European Commission, researchers, and local communities and suggests ways to improve the indexes. The book emphasizes justice as it is the most prevalent ethical principle in the sustainability literature and most neglected in index development. 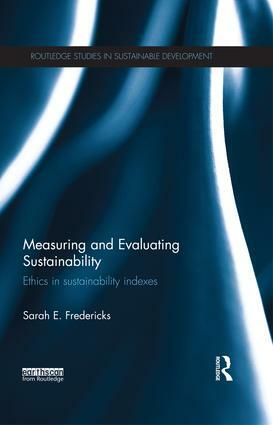 In addition to the ethical principles common to international sustainability initiatives, the book also employs a variety of religious and philosophical traditions to ensure that the ethical evaluations performed in the text align with the ideals of the communities using the indexes and foster cross-cultural ethical dialogue. This volume is an invaluable resource for students, researchers and professionals working on sustainability indicators and sustainability policy-making as well as interdisciplinary areas including environmental ethics; environmental philosophy; environmental or social justice; ecological economics; businesses sustainability programs; international development and environmental policy-making. Environmental justice: a resource for sustainability indexes?